If you have been a college instructor for any length of time, you have most certainly gotten this question from students: "Why did you take points off for _____?" This question is based on their assumption that they start at 100 rather than zero, which is where I believe they start before an assignment has been graded. If they fail to turn in an assignment, they are given the current point value, which is zero. I do not, in fact, take away all of their points as a fiery demonstration of my absolute authority in the classroom. The disparity between the way I see this issue and how my students view it comes down to a difference in understanding about how rubrics work. My students tend to think I am doing math while I read their papers (1 point off for this, 2 points off for that ...), when what I am actually doing is just reading their papers and looking for the things I told them I was going to be looking for. These "things" we will call criteria, and each criterion is explained in the rubric. The criteria are, in reality, my standards for what I expect on each assignment. I understand that some students will meet the standard, and others will fall (either a little or a lot) short of it because they still learning. When they fall short, I give them feedback for what to work on so they can meet the standard. Say it slowly ... l e a r n i n g. For example, when I write in the rubric that in order to get a 4, "All references to other sources are properly cited using APA (6th ed.) format", that is actually what I am expecting. I will not give a 4 for something that did not match the description for a 4. This is one of my standards for excellent (4-level) work. Their work may be close, but it' s not quite there, hence, the 3 instead of a 4. I didn't take off points as a punishment; they just didn't quite get there this time. This gets complicated when I have to take that feedback and turn it into a grade. My hope is that the feedback take precedent over the grade, but I have been in this profession long enough to know that students want a grade. Most of them want to know the market value of their work, and I want to be as thoughtful, accurate, and consistent as possible when giving them both the feedback and the grade. So, how does one go about this? You can also add fields to give the students pre-written feedback. I know some people disagree with this, but when you grade 30 of these bad boys and find yourself giving the same feedback on every (freaking) paper, something has to give. Below are some examples of canned feedback I give students. I included an "other" field so I can write in specific comments for students that may not apply to any other paper. And trust me, I use this field liberally. Since I am converting the rubric feedback into a grade, I know that some criteria are more valuable than others. I would rather see students supporting their claims with high-quality evidence than putting the comma in the right place. Both are important, but not equally important. Basically, what the spreadsheet is doing is converting your score of 4 into a percentage of 5, which is the highest score possible. The spreadsheet then adds all of the converted scores and multiplies them by 20 (which is 100 divided by 5, the highest possible score). The resulting grade is below, I used colored squares in an attempt to show which cells correspond to each other. I also checked the appropriate canned feedback and added in my own comments. You will notice below that using the checkboxes puts commas in between each comment. You can get rid of those by using the Find and Replace tool. This is the magic ingredient that helps this rubric keep you very productive. You will need to find the copyDown add-on for Google Sheets and install it. Once you have all your formulas in Row 2 of your spreadsheet, copyDown will detect those formulas and apply them to every subsequent row that is submitted through your form. In other words, the values you enter will be automatically calculated without any effort on your part. This is what makes the rubric a self-grading rubric. Yes, it's that simple. I use FormMule to send the feedback to the students, but you can do whatever you want. I guess this depends on how many students you have and how much time you have. You could copy and paste the feedback into Word and e-mail it to the students, or you could use the comments tool in your CMS. For me, FormMule is the way to go. The main drawback to doing it this way is that I cannot put my feedback in the form of comments within the paper, which can be helpful. I will have to find a way to do this, but for now I am using this system. What techniques do you use for calculating student grades on assignments and giving them the feedback quickly? For the past two weeks, the students in my graduate class have been exploring various ways to provide scaffolding to learners using digital tools. These explorations have been grounded in an article we read by Mayer & Moreno (2003), which describes 9 practical ways to reduce cognitive load using instructional design principles and digital tools. The students have done everything from creating QuickStart guides with screenshots and Word to screencasts with Screencast-o-Matic to "flipped" lessons with Educreations. The main theme that emerged from all of these explorations is that digital tools, while easy to access and use, are still quite complex and rarely work in isolation. Content creators need to understand a variety of tools to create, share, and distribute their digital products. Some people call this digital literacy. Teachers rarely have time to devote large blocks to teaching their students how to use digital tools, which is why it is helpful to have a variety of techniques to record and share explanations which can be viewed outside of class time. This is the beauty of digitally-supported scaffolding. Teachers can continue to support student learning even when class is not in session. To further explore this concept tonight, the students created visual tutorials with Snapguide. I found this tool when I was looking through the help resources for another tool, InfuseLearning. I really liked the interface, and when I saw the iOS app I was really impressed with how easy it is to use. The students and I agreed this would be a great way for kids to practice How-To writing, and for teachers to send visual instructions home. I remember sending home detailed written instructions for parents when I was teacher, and the science projects STILL did not come back done correctly. I would have loved to have something like Snapguide to visually walk the students through the project. It's amazing to me how visual our culture is. Now that seemingly everyone is walking around with small computers in their pockets, there is no end to the media people can create about everyday processes and skills. In addition to being visual culture, we are a culture of sharing. Snapguide combined with other tools like Pinterest, Facebook, and Twitter give us the potential to learn just about anything. Check out How to Make a 3D Foldify by TCU Horned Frogs on Snapguide. Check out How to Make a Paper Bus by TCU Horned Frogs on Snapguide. Check out How to Create a Foldable Mini House by TCU Horned Frogs on Snapguide. What tools do you use to learn and share new things? In the past several years, I have come to rely on Web-based website builders quite extensively in my teaching. I typically use Google Sites for the bulk of my Web content with my classes, and it has always been very reliable. I have noticed lately that the editor doesn't always load in the newest versions of Firefox. This isn't a big deal because I can jump over to Safari and finish whatever edits I need to do. Anyway, what started as a way to write lesson plans without having to move files with me wherever I went has evolved into a complete lecture management tool. I started using SeedWiki circa. 2005 because I found myself planning my lectures at odd times, using a host of different computers. Using a wiki was a perfect solution because I could log in from anywhere and pick up where I had left off. I also liked the wiki because I could paste links and other resources directly into the page. It was a great tool. Time management: I would organize each section of the class meeting using cells in a table, including the amount of time I thought we would spend on each section. Each section of the class meeting has relevant links, embedded videos, documents, etc. Collaborative Learning: Keeping track of group work and collaborative learning can be a nightmare. One area of my teaching that I noticed was in serious need of improvement was keeping the class on track during group discussions. We've all seen this technique used, and it did not come naturally to me. What I noticed in many instances was that the students would spend about 60 seconds discussing the topic, then they would digress into conversation and have nothing to show for their work. Essentially, group discussions lacked accountability and there was no incentive for staying on task. What I began to do, and do to this day, is determine ahead of time how many groups the class would be divided into and create that many pages as part of the class wiki. Each group would then summarize their discussion on the assigned page. I was able to get creative too, throwing in such tasks as finding a random picture on the web, or finding a movie clip that corresponded to their main idea. As soon as the group clicked save, I was able to display their summary to the rest of the class. I had a built-in record of what each group talked about, and because anyone could edit the page, no sign-in was required. Lecture Archive: Because everything that we covered, as well as what we did in class, was saved to the wiki for that day, I had a detailed archive of the class meeting. More detailed than I could have created on my own because the class helped me do it. So, when a student would come to class and ask that question that all professors love to hear ("Did we cover anything important last week? "), I could point them to the wiki and tell them that EVERYTHING on the page for that day is important. When you go to start a class activity and half the class can't access the Site, it gets pretty frustrating. UVa eventually moved to Google Apps for student e-mail accounts, so this reduced some of the friction, but it was still very clunky. In Google Sites' defense, I don't think they ever intended for the tool to be used in this way, and restricting editing access to only those with permission is a security measure. Recently, I rediscovered Wikispaces, and I think the tool has come along to point where I will start using it exclusively for all of my lecture management needs. I typically use Wikispaces about twice per semester with each of my classes, but I am starting to see how it is much more effective than Google Sites for use in a learning environment. First of all, the teacher can add users to a wiki in bulk. All you do is create a spreadsheet with usernames and passwords, and upload it to the wiki. Students then have access to the wiki, and they didn't have to sign up or respond to a confirmation e-mail. This option is superior to making the wiki editable by anyone, as you will see later. Second, you can create Projects within the wiki. These projects are partitioned off from the rest of wiki, making it much easier to manage each activity. Otherwise, the list of your wiki's pages gets to be pretty burdensome and hard to manage. Every time you create a new project, you can drag-n-drop the names of students into different teams, or you can let Wikispaces randomly assign students to teams. This is great for mixing up student groupings and getting students out of their comfort zones. The alternative is letting the students always pick their own groups and essentially work with the same people all semester. Finally, there is a Discussion tab for each page, which you can use in several different ways. You can have students follow up with group projects by discussing key questions in a back channel. I haven't used this particular feature much, but I plan on using it more. There are many reasons to use a wiki to manage your class meetings, some of which I have discussed here. What are some other ways you have used a wiki as part of your teaching? When I was in college, I took a semester away from classes to live in Ecuador with a friend of mine and completely immerse myself in an unfamiliar country and culture. Most of my adventures were unplanned, such as getting on the wrong bus, ending up in some unfamiliar place and trying to get back home alive. Those days were fun and made the trip seem less like real life and more like a movie. Some of my adventures were planned, such as going to the jungle or climbing on of Ecuador's many volcanoes. 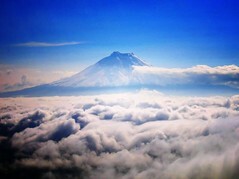 The most beautiful volcano, El Cotopaxi, particularly held my fascination because of its massive beauty. One day I remember telling my host family that I was going to climb El Cotopaxi, which was only a few miles from their family's dairy farm. They tried to discourage me from doing this because of the stories they'd read over the years of inexperienced climbers (mainly from Europe) trying to climb without an experienced guide and getting caught in a crevasse. Their fear was not the climbing, the cold or the altitude, although these were all things to be prepared for. They were most fearful of the crevasses, and if you wanted to climb the volcano successfully you had to know where they were. I find this story particularly relevant to using technology in my teaching. Actually, if I am the one using the technology, I don't think too much about the crevasses because they typically only affect me and waste my time. Sometimes a certain tool won't work correctly in the middle of my teaching, so the students get to sit there and watch me try to maintain composure, but I have learned how to avoid those embarrassing moments pretty well. The tools I use, I know them well, and I take extra care in learning new tools. However, it's an entirely different story when I am teaching my students how to use a tool. I feel a lot more pressure to structure my instruction in a way so their time is not wasted or they don' t get needlessly frustrated. It's quite intimidating, actually. For example, I was just talking to someone about how to convert multiple scanned documents (JPEG files) into a PDF. I thought I had given pretty good instructions, but I forgot to inform them of a particular crevasse, and this person ended up accidentally deleting all of the scanned files. We were able to recover them, but that did little to calm the pure anger at me and the technology. This story just reinforces to me what it means to be technology literate, and how difficult it is to know the ins and outs of tools in order to help novice users steer away from the major time drains. But it also reminds me that every bad experience just develops my cognitive complexity a little bit more and will help me teach it better the next time. So don't stay off the volcano. Get out there and have some fun, but don't forget to make a note of the crevasses. Someone else's time might just be at stake. I hadn't ever heard the term "scaffolding" until I started grad school, then it seemed like I heard the term used all the time in very different ways. It was similar to the way rhetoric was used when I started my master's program in Communication. Every professor had his or her own definition of "rhetoric," and I quickly learned that if I synthesized all of the definitions then everything was rhetoric. And if a concept is everything, maybe it's really nothing. Well, I don't think that is true of rhetoric or scaffolding. However, after having completed my doctoral program, I will admit that I still don't think I have a good defintion for scaffolding ... the kind of defintion that would make sense to an insurance agent or sales rep whom I happened to meet at a dinner party. I recently heard a non-education person refer to scaffolding as the ugly stuff surrounding a structure that is used to help make it bright and shiny again. This definition was given in a spiritual context, so it doesn't totally apply to education. However, there are some aspects of this definition that apply to teaching and learning. 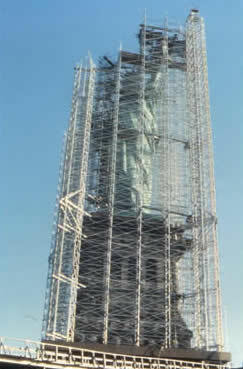 The first is the notion that scaffolding is something that is eventually removed. A builder or painter does not leave the scaffolding on forever, just a teacher strives to remove the supports that students rely on to complete academic tasks. The second application of this definition is that the end product of learning is some sort of improvement growth. The question about what improvement or growth looks like is a totally separate topic, and the value of the such growth and improvement may differ between student and teacher. However, an underlying premise for scaffolding is that there is an indentifiable change in what a student knows, understands or can do. Otherwise, why take the time to put the scaffolding up in the first place? I will explore this topic more in coming posts.